As usual I was active throughout the weekend on the HF bands during this years CQ World Wide Contest. I spent some cash on a new alloy pole which I used to raise the height of my Cobb-Webb multi band antenna just in the knick of time. 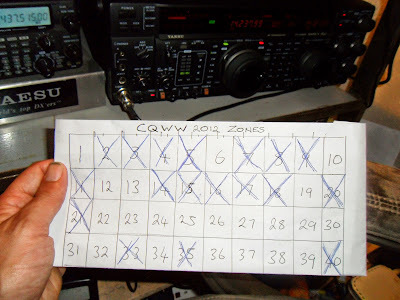 Despite my enthusiasm I did not beat last years result as I ended up working fewer zones than previously, but I still had some great DX even though conditions were not quite as good as last year. I worked lots of stations from all over using my FT1000MP Mark -V and Cobwebb antenna. I kept myself mainly focused on 10 meters, 15 meters and 20 meters with a few qso also made down on 40 & 80 meters. Overall I had a blast! I must have worked the whole of the Caribbean as well as South and North America. My signals were radiating well into Africa, The Middle East and all the way up to Iceland and Greenland. I heard Taiwan very faintly up on 10 meters but did not really experience any reliable openings to Australasia or Asia during this years contest. However there is always next year. See you then if not before on the bands. 73. The Chinese Amateur Satellite Group CAMSAT are busy constructing two new birds that will have the potential to establish a radio link during certain orbital positions between the two. This will allow amateur radio communications to be made over a much greater distance. Its exciting news for the many hams that enjoy the challenge of space radio communications which includes myself. I am already getting excited about the possible Space to Earth QSOs that I maybe able to make! Yep, I am looking forward to the future launch of CAMSAT's CAS-2A1 and CAS-2A2, Good luck to all involved! Both birds will be equipped with linear transponders. For all the latest in much more detail including operating frequencies, check out the AMSAT UK write up here CAS-2A1 and CAS-2A2 linear transponder Amateur Radio Satellites courtesy of M5AKA.